Bringing you a new word to help you get through the week ahead. Words matter! And so do you. This week’s word is WINNOW - What can you purge and release from your life? What’s no longer needed? #springclean Also, Robin from wanderingaunt.com chats with Liz about how businesses clean house, transforming her daily-used words to feel more empowered (don’t SHOULD on yourself! ), and the difference between your head and your heart. This week’s word is GAMBOL - let’s have one (or two), shall we? What are you celebrating this week? Also, Emily the event genius shares her thoughts on the word, what her next big event will be (you’re gonna wanna come! ), and how language reveals more than you think. This week’s word is UNFEIGNED - a past participle of the word FEIGN (yes adjectives can have past participles!). This week is about integrity and walking your talk authentically. This is also a word with a varied evolution! #wordnerdfun Jen McFarland stops by and chats with Liz about living with an open heart, being genuine, and why this week’s word should be a perfume. This week’s word is TEMERITY - all about being bold and brazen. This word has so many scrumptious synonyms! Can you bring some bite to your week? Also, Kat nerds out with Liz about reading, being a badass, and how libraries can help raise children. Shout out to all the local community libraries out there! You are doing great work in the world - thank you! This week’s word is BESOTTED - can you feel infatuated with your life this week? What in your life can you fall back in love with? Also, Jen B drops by to chat about Thumper from Bambi, high school hijinks, and being an English-to-English translator! This week’s word is ASSIDUOUS - because with great care comes great perseverance! This week is all about taking clever action. Also, a big thank you to all you listeners. Seriously, thank you! Plus, Anne from creativelyrich.com shares her radically different perspective to this week’s word, along with sage money advice! This week’s word is PITH - short, but not sweet! Set some boundaries this week, put your foot down, and be mighty! Also, Haley visits with Liz and shares her pearls of wisdom on motherhood, choosing words carefully, and peeling back language like an onion. This week’s word is INDUBITABLE - for when you feel uncertain, or need a bit of a boost! You know who you are, deep down you already know. That’s what this week needs - your certainty! Also, Bev gives masterful tips on neuro-linguistic programming and intuition with Liz, shares her love of books, and brings her own brand of wonder and positivity to this week’s word. This week’s word is PROLIFIC - creatively speaking, here’s to a week full of new babies to nurture! Brainstorm sesh, anyone? Also, Angela giggles her way through a chat with Liz about journaling and spirituality. This week’s word is VELLEITY - bring a little imagination to this week ahead, especially with loved ones! Also, Leah chats with Liz about growing up with language experts, and license plate Scrabble. This week’s word is ASTUTE - let’s try to observe first, then act during this week’s activities. Also, Leslie gets some herbal help before talking to Liz about whether manipulation can be a positive thing, holiday birthdays, and how she’s a better actress than she realizes. This week’s word is EBULLIENT - let some joy, cheer, and laughter into your week! Also, Carlee stops by to talk to Liz about energy management and how language can improve your daily routine. This week’s word is LARGESSE - a fitting word for this week’s lunar eclipse, as well as the US holiday honoring Dr. Martin Luther King Jr. What goods have you harvested in your life? Who can you share with? Also, Charlene from HipShakeFitness chats with Liz about what generosity means to her and how real kindness can leave an impact. This week’s word is DYNAMISM - let’s activate how we move through life this week! A little vim and vigor anyone? Also, Sonja gets philosophical with Liz and ruminates on how we can more authentically communicate in the world. Star Wars fans, you might really love this word! 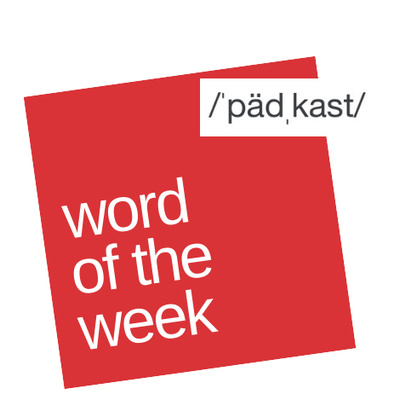 Welcome to Word of the Week! This week’s word is SANGUINE - ideal for bringing joy and glee to the week ahead. Especially as a new moon occurs, can you bring SANGUINE to your new project or tasks? Also, Jen and Liz chat about the difference between being well-read and well-spoken, making up words, and staying positive in the face of negativity.